We spent last night re-watching the movie "The Holiday" before it has to go back to the store on Tuesday. Best movie, ever! I may even watch it again today. I Love this movie! It was actually a unexpected surprise since I did want to see it in the movies, but never got around to it. Shannon actually ended up bringing it home a few days ago, and we fell in love with the story. If you haven't seen the movie, which due to its cross cultural play on the fantasies of us women on both sides of the Atlantic, became hugely popular; the plot is basically about two women (Iris played by Kate Winslett and Amanda played by Cameron Diaz) and their love stories as well as the people they love. The plot revolves around how their fates intertwine when the two of them swap houses as part of a holiday home exchange program. Oddly such a concept does exist, and it seems quite interesting till you realize, somebody will be rummaging through pictures of you in your closet. (I've been told to get a closet with a locking key!) So last night while the DVD was playing, I had a thought. 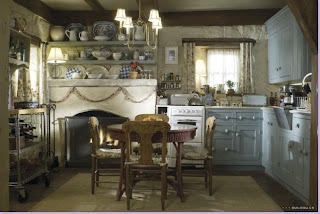 A question actually; does this house, the Rosehill Cottage that Amanda rents, does it really exist? Meant to be an idyllic Christmas cottage. It took me a while, but eventually I discovered the answer: unfortunately no. 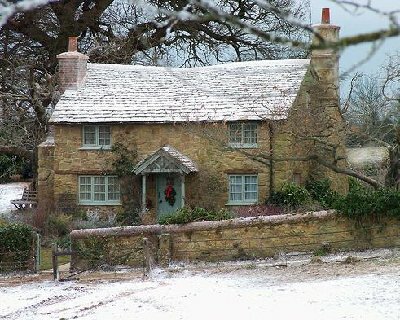 The whole idea of a romantic, quaint little Christmas cottage in the middle of a field is nothing but Hollywood fantasy. Apparently the whole house is a fiberglass set built in a field in Shere (or Sheire or Shire), a village on the river Tillngbourn in Surrey, England. 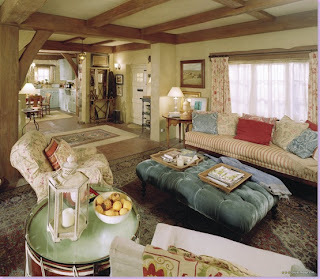 Worse yet, for our little fantasies, the interior of the house was actually constructed on a sound stage in Los Angeles. A rather unique view inside Iris's living room. The ironic thing about the whole movie is in the final climatic scene where Amanda (Diaz) is running back into the Rosehill cottage in a feverish panic, she's doing the running in Shere, England. Then as soon as she walks through the door, she's suddenly in Los Angeles, I'm even fathoming a guess that the scene was shot back to back with other interior shots, meaning everything, all that this requiem-of-a-chick flick is, is nothing but some faux fantasy created by the writer, Nancy Meyers. This is unfortunate for the congregation of romance fiction fans, both in the UK, and the US, who for some reason or another was hoping this was actually a partially factual realization, or at the very least held some element of reality. Apparently, hoards of women (and men) who don't know this, call the town's phone number and asking about the Holiday house. 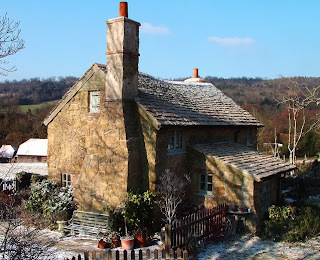 Shere feels like this little isolated village and we found this lovely spot on the hill over-looking the village where we built this cottage. That was perfect." He said they are also filming in Godalming and that scenes from the two villages will be sewn together in the film to make it look like one place. Iris's House in the Holday. Apparently the film has caused such a response, that this tiny little village was forced to post tourist information on their website for individuals wishing to visit the area and walk in Iris's and Amanda's footsteps. But it appears all is not lost for us die hard romantics. Even though Nancy did create a Holiday universe in which Cary Grant was born in Surrey, (In reality he was born in Bristol.) indicating a fictional world for this film, several aspects of the film do exist in this little village of Shere. Love does not go on Holiday. The field, the cemetery, Saint James Church, even the White Horse Pub (bar) that Graham (Jude Law) makes his way back from drunk and on to the steps of the Rosehill Holiday house, all exist in real life. Even the cottage in the movie appears to be patterned after many cottages in the area, although not isolated in some snowy idyllic location. (Which is the reason they constructed one there.) Many of these cottages can be let for about a thousand-dollars (U.S) a week for your own personal "holiday." Surrey, oddly enough, was the also the film site of some scenes from Harry Potter, The church in the Omen, and the opening scene from the movie Gladiator; not to mention the Diary of Bridgette Jones, and the now defunct television series Will & Grace. As appealing as this little village seems on DVD, I can't wait for my opportunity to find my own false romantic notion when I get to visit the set of the Holiday in Shere Surrey. Mill House does exist in Wonersh, Surrey. It is a Grade II listed building from the 15th century. There is some conflicting information on "the shoppe" from the Holiday. It does exist, though not in Surrey, we are sure of that. It's on Church Street in Godalming, (a town about twenty minutes from Shere) which was renamed "High Street", and one of the shops in the filming was Cafe La Creme, though we've had various reports saying the actual Christmas themed store in The Holiday, was a tile shop. for all the americans who visit london spend 45 mins to come down south to shere , gomshall and the surrey hills . its amazing!! !